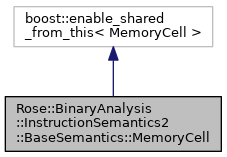 MemoryCell objects are used by the MemoryCellList to represent a memory state. Each memory cell has an address and a value. A cell also has an optional list of instruction addresses that wrote to that cell, and this list is manipulated by the RiscOperators separately from updating cell addresses and values and according to settings in the RiscOperators. Cells written to by RiscOperators typically contain one writer address since each write operation creates a new cell; however, the result of a dataflow merge operation might produce cells that have multiple writers. Definition at line 24 of file MemoryCell.h. Definition at line 26 of file MemoryCell.h. Definition at line 108 of file MemoryCell.h. Definition at line 113 of file MemoryCell.h. Definition at line 121 of file MemoryCell.h. Definition at line 126 of file MemoryCell.h. Returns all instruction addresses that have written to the specified memory address. Definition at line 162 of file MemoryCell.h. Insert the specified instruction addresses as writers for this memory cell. Returns true if any address was inserted, false if they were all already members. Definition at line 172 of file MemoryCell.h. Definition at line 173 of file MemoryCell.h. Removes the specified addresses from the set of writers for this memory cell. Returns true if none of the writer addresses existed, false if any were removed. Definition at line 182 of file MemoryCell.h. References Sawyer::Container::Set< T, C, A >::erase(). Definition at line 183 of file MemoryCell.h. Changes writer information to be excactly the specified address or set of addresses. Definition at line 192 of file MemoryCell.h. Erases all writer information for this memory cell. Definition at line 198 of file MemoryCell.h. References Sawyer::Container::Set< T, C, A >::clear(). This set holds Boolean input/output properties. If a property is present in the set then it is considered to be true, otherwise false. Definition at line 206 of file MemoryCell.h. Definition at line 207 of file MemoryCell.h. Two cells may alias one another if it is possible that their addresses cause them to overlap. For cells containing one-byte values, aliasing may occur if their two addresses may be equal; multi-byte cells will need to check ranges of addresses. Two cells must alias one another when it can be proven that their addresses cause them to overlap. For cells containing one-byte values, aliasing must occur unless their addresses can be different; multi-byte cells will need to check ranges of addresses. Definition at line 245 of file MemoryCell.h. Definition at line 246 of file MemoryCell.h.